The question of security and cloud computing is one of the very well argued discussed and debated topic. It’s also one of the very common question I get in my sessions. What ever said and done I personally believe that talking about security regardless of in the cloud or not it has 2 major characteristics. Ok, leaving the arguments of security, let’s jump into the Azure blob storage data security. How much secure the Azure data centers are ? What is the security for the data in transit ? Does Microsoft look or access my data stored in Azure Blob ? What are the policies should I follow in order to store data securely in Azure Blob ? If you’re concerned that Azure data centers aren’t secured enough that physical security breach easily be possible, then you are not going to use the Azure in the first place. And there are tons of articles and videos in the Internet explaining the data center security features of Microsoft Azure. All the communications with the Azure and also within different data centers in Azure happen via https so it’s secured via TLS. There are some services which can be accessed (blob service included) with the http but by default this is turned off and it is not recommended to turn it on unless specifically required. The direct answer from Microsoft is No, and indeed it’s true to my knowledge. But as per in the agreement Microsoft might collect the telemetry data of your blob storage in terms of billing, usage patterns and service improvement parameters. All your cooperate policies that you apply on premise and also additional policies that you have defined in your organization to store the data outside the cooperate firewall should be applied when using Azure Blob storage. But this is very unique and different to each company. With all that information Why do you need to encrypt the data at rest from any public cloud provider ? This is a question I ask from the customers when they request me to encrypt the data. Of course there’re several reasons mostly it is due to the cooperate policies which state any data at rest outside the cooperate firewall should be encrypted and also there’re cooperate policies that define the data should be in a specific political and geographic boundary. This is another concern in architecting the applications and selecting appropriate redundancy policies. Other than the above reasons some customer have complained that we want to protect the data from our public cloud service provider, and prevent them reading the data. This is acceptable for some extent but again this raises plenty of other arguments like how and where to keep the encryption keys and how to secure them. Azure blob storage does not provide any inbuilt mechanisms to encrypt the data at rest. We have to handle this in our application. First selection of the encryption is very important. Since we’re talking about encrypting the data at rest symmetric encryption serves the purpose well, we do not need to put asymmetric encryption and overwhelm the situation. Third we should be aware when and how to apply the encryption – As the best practice always encrypt and decrypt the memory streams of your blobs. So you ensure that data is encrypted before hitting the disk. In a web application encryption and decryption happens in the web server. 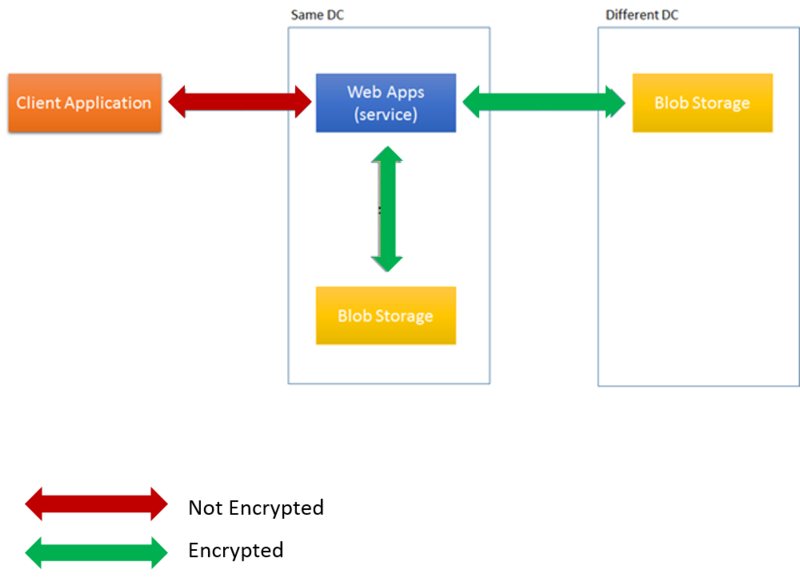 The following diagram explains a scenario where there’s a web app and a blob storage in place and how encryption/decryption happens for the data at rest. Performing the encryption and decryption in the stream helps to protect the data before it hits the disk. See the code below. Which Azure Cache offering to choose ? Are you awaiting at the right place? Provisioning Always Encrypted in SQL Databases with Azure Key Vault, using SSMS 2016. Directory contains one or more applications that were added by a user or administrator.